An amazing use of sweet potato. After the potatoes are baked they need to be very well mashed. Well, they are – if you do that step. Increasingly people are discovering that you don’t need those ridges to enjoy gnocchi. In fact, most people who make them at home skip that step altogether. 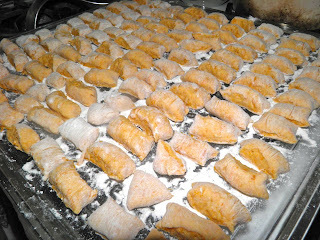 Pillow gnocchi are probably quite common in country kitchens in Italy, although I can’t say for sure. What I can say is this recipe makes a lot of gnocchi. You can easily make enough for two meals with this one batch. Once you get the hang of it they go along relatively quickly. 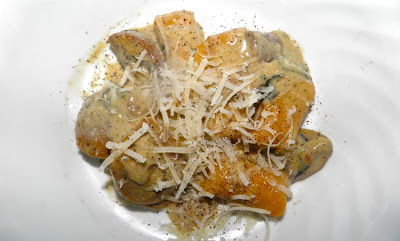 Homemade gnocchi screams comfort food. The rich cream sauce is nicely infused with fresh sage, and the mushrooms, sausage and gnocchi round it out to an extremely satisfying meal. Sausage are not a necessity. Omit and you've got a vegetarian meal. They can also be simply tossed in a marinara or cream sauce as well, and they take to baking like a duck to water. Try them as a substitute for macaroni in cheese sauce too. Amazing. The trick is to not make them too big, or the dough too stiff. That way they avoid becoming heavy and tough. Only add enough flour to make a dough that feels “pillowy.” There’s really no words to describe how gnocchi dough feels. But you’ll understand when you make them. I’ve made gnocchi several times now and I have yet to screw them up. Since the recipe is quite “descriptive” I’ll stop my blather and get down to the nut – or in this case – yam of it. Roll each piece into a log and cut into "pillows.". This is only part of the gnocchi this recipe makes. 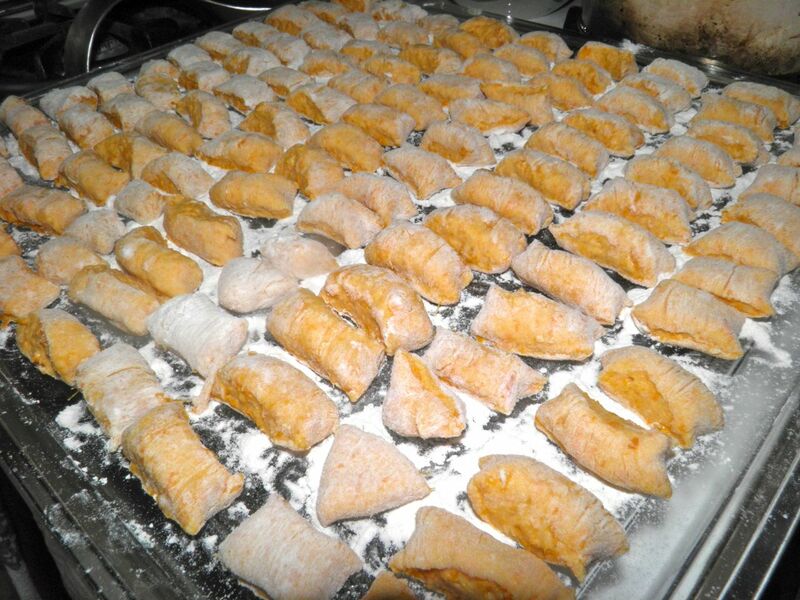 To make the gnocchi, bake the sweet potatoes at 350°F for about 1 to 1.5 hours. They will be very easy to pierce with a fork. Baking (as opposed to boiling) accomplishes two things: it doesn’t introduce any water into the potato flesh and it develops the sugars. Once the mash has cooled slightly break an egg into the bowl. Add the salt and nutmeg. Mix in vigorously with a fork. Make sure the egg is well distributed. This is where it gets “tricky” (but just a little). 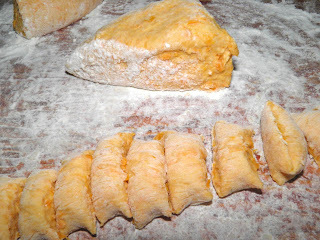 You want to introduce only enough flour into the sweet potato to make a soft dough. Too little and they will disintegrate when cooked and too much will make them heavy. 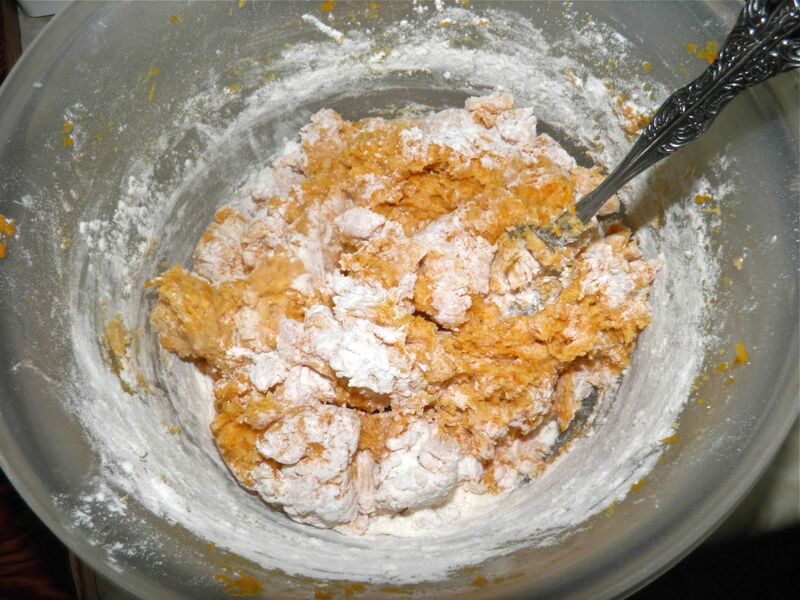 The amount of flour has everything to do with the wetness of your sweet potato mash. Start with 1 cup of flour. Sprinkle it on top and mix in with a fork. 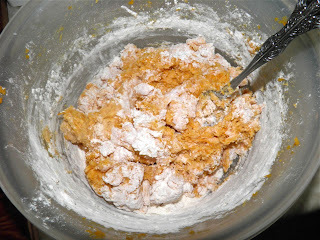 Add more as needed until you have a very ragged dough. Sprinkle a board, or your counter, with flour and place the dough on it. Begin to knead, adding more flour slowly, until you have a moist, light dough. 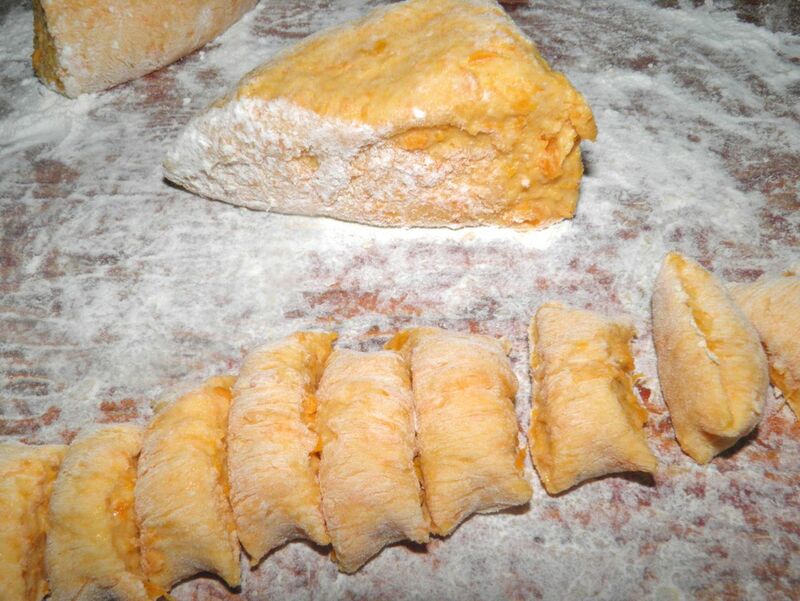 Divide the dough into six pieces and roll each out into about a 1” diameter by 16" long log. Cut “pillows” of gnocchi from each log. Place on a well floured board as you go. Repeat with the remaining dough. You will see you have made a lot of pillow gnocchi. To cook the gnocchi, bring a pot of salted water to a rolling boil. Drop several of the gnocchi in at a time. At first they will sink, but as they cook they will bob to the surface. Let them cook, once lifted from the bottom, for about 1 more minute. Remove the gnocchi to a bowl. Repeat until you have cooked all the gnocchi you will need. While the gnocchi are cooking, boil the sausages in water until done, about 5-6 minutes. Then slice into easy to eat sized pieces. To make the sausage and sage sauce, heat the oil in a large sauté or frying pan. Add the sage and garlic and let it cook for about 1 minute. Quarter the mushrooms and add to the pan. 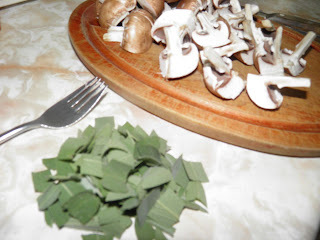 Let the mixture cook until the mushrooms wilt and/or begin to brown. Add the sausage slices and mix well. Then add the cream, salt and pepper. Let the sauce simmer until the cream has reduced to your desired consistency. At the last minute add in the gnocchi, toss to coat well. Let heat through and serve with grated parmesan on top.